Co. Down native Rhys McClenaghan is gunning for medals in Australia this weekend. 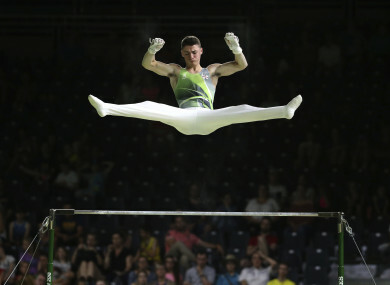 Northern Ireland's Rhys McClenaghan competes on the parallel bars at the men's artistic gymnastics competition at Coomera Indoor Stadium during the Commonwealth Games on the Gold Coast, Australia this week..
AS A CHILD, Rhys McClenaghan was a ball of irrepressible energy. So much so that his parents decided to enrol him in his local gymnastics club. After all, if anything is sure to tire a child out, it’s doing leaps and somersaults. That was when he was six-years-old. Since then, the Co.Down native has established himself as the country’s top male gymnast and a leading Irish prospect for Tokyo 2020. It’s quite a feat, especially for a teenager from Newtownards, Co. Down But McClenaghan is as motivated a teenager as you’re ever likely to come across. He speaks more confidently and assuredly than most adults, and you get the impression that he has a five-year plan drawn up somewhere. In fact, he’s always been a forward planner. As a child, he dabbled in sports like football and swimming, but quit both in order to dedicate himself more fully to gymnastics. Growing up, this unwavering commitment to his sport left many of his friends and peers flummoxed. He also faced slagging about being a boy in what many still view as being a traditionally female sport. But that soon changed when he started competing at more high-level competitions. His breakthrough came in 2016 when he won a bronze medal in the pommel horse at the British Championships, placing behind Olympic medallists Max Whitlock and Louis Smith. This, despite the fact he was still only a junior. Not only did he enjoy the moment, but he wound up doing his best routine to date scoring 15.175. As he stood on the podium with Smith and Whitlock, ‘two of the best pommel horse workers in the world,’ McCleneghan said it imbued him with a newfound confidence. “It was one of those moments where I was like, I believe now I can be one of the best in the world,” he recalls. A word about the pommel horse. It is by far McClenaghan’s best event. In 2016, he was the first Irish gymnast to medal at a European Championships when he won gold in the pommel horse in the U18 category. Last year, his pommel horse routine saw him finish in a very respectable 14th at the World Championships. It’s all the more impressive when you consider his age. McClenaghan says that the world’s best pommel horse specialists tend to be a little bit older than specialists in the other apparatus. But don’t pigeonhole him just yet. While he may excel at pommel horse, McClenaghan continues to see himself as an all-around gymnast. His aim over the next two years is to improve as an all-around gymnast. That means more consistency, increased difficulty and higher scores. All of which should come in handy ahead of the Olympics. Last year, McLenaghan was one of a dozen Irish athletes to be awarded an Olympic Solidarity Scholarship to assist with preparations for Tokyo 2020. To date, just three Irish gymnasts have participated in the Olympics – Barry McDonald, Kieran Behan, and Ellis O’Reilly. McClenaghan is respectful of the Irish gymnasts who came before him, but he’s not shy about his desire to deliver better performances. To paraphrase Conor McGregor, he’s not here to take part. Once he graduates from college this year, his plan is to train full-time under coach Luke Carson at Rathgael Gymnastics. There are competitions aplenty, including the European Championships in August and the World Championships in October. This weekend, though, it’s all about the Commonwealths. Will he find himself standing on a podium with Max Whitlock again? As McClenaghan has proved time and time again, anything is possible. Email “'I don’t want to go and just take part in the competitions' ”. Feedback on “'I don’t want to go and just take part in the competitions' ”.